Always Look Before Serging! – Everything Your Mama Made & More! Just like you were always taught to look both ways before crossing the street, you got to look at your fabric before serging… espeically when half way done with a garment!!! 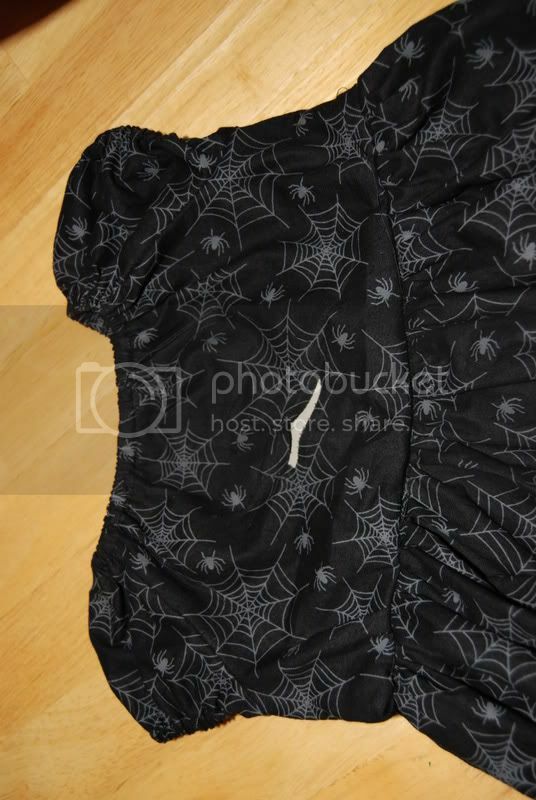 If you saw my blog post yesterday you know what this is about… the twins Halloween dresses I have been working on. Well the good news is I managed to get the other one finished to the point of adding the tie without making any more mistakes!! I just want to fix this one before I switch out all my black thread. I thought about an applique but it would have to be a good size & would look odd in the middle of the back, especially since when it has the white petal ties tied in the back will make it more gathered on the back of the bodice so it would look wonky. Since I already have elastic in the neckline its not as easy as just replacing the piece. Any suggestions? Leave me a comment!